MONDELL, Frank Wheeler, a Representative from Wyoming; born in St. Louis, Mo., November 6, 1860; raised in Dickinson County, Iowa; attended the common schools; engaged in mercantile pursuits, mining, and railway construction in various western states and territories; settled in Wyoming in 1887 and engaged in the development of coal mines and oil property in the vicinity of Newcastle and Cambria; took an active part in the establishment and building of the town of Newcastle, Wyo. 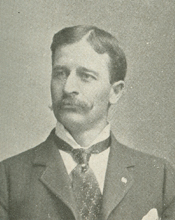 ; elected mayor of Newcastle in 1888 and served until 1895; member of the first state senate in 1890 and served as president of the second senate in 1892; delegate to the Republican National Conventions in 1892, 1900, 1904, 1908, and 1912; elected as a Republican to the Fifty-fourth Congress (March 4, 1895-March 3, 1897); unsuccessful candidate for reelection in 1896 to the Fifty-fifth Congress; appointed assistant commissioner of the General Land Office on November 15, 1897, and served until March 3, 1899; elected as a Republican to the Fifty-sixth and to the eleven succeeding Congresses (March 4, 1899-March 3, 1923); chairman, Committee on Irrigation of Arid Lands (Fifty-eighth and Fifty-ninth Congresses), Committee on Public Lands (Sixtieth and Sixty-first Congresses); majority leader (Sixty-sixth and Sixty-seventh Congresses); did not seek renomination in 1922, but was an unsuccessful candidate for United States Senator; appointed a director of the War Finance Corporation in 1923 and served until his resignation in July 1925; studied law; was admitted to the bar in 1924 and commenced practice in Washington, D.C.; delegate to the Republican National Convention in 1924, serving as chairman; died in Washington, D.C., August 6, 1939; interment in Cedar Hill Cemetery. Papers: 1894-1959. 9.12 cubic feet. Personal, business and congressional papers and correspondence, including the manuscript of an autobiography, constituent correspondence, speeches, scrapbooks, news clippings, photographs, and memorabilia.